Lee “Kix” Thompson is a most unlikely character. Early career choices had him spend a year in a detention centre. He still hasn’t found the receipt for his first saxophone. Luckily he met two other unlikely characters: Mike Barso Barson and Chrissy Boy Foreman who shared his interests of graffiti, train hopping and music. This hilarious and joyful film follows the journey of Lee from meeting Barso and Chrissy Boy, and later Suggs, Chas, Woody and Bedders, and them starting to make music together in what was to become one of Britain’s most iconic and successful bands, Madness. I considered buying the signed poster, thought £32 was a little steep and would still need to buy the dvd, but was going to order anyway - until I saw another £6.90 was to be added for P&P . Decided that was too much, would happily pay that if signed by the whole band but not one member. Thought the signed expanded DVD was overpriced too at £30 plus P&P. I like the trailers for the film and have been thinking of supporting it (despite the horror of other pledge campaigns). But the private screenings only really suit those in or around London. And the script (at £75) and collectors edition dvd (£100) are rather pricey. Still thinking about the £30 version which has P&P of £3.80 - a bit more reasonable than that £6.90 to send the poster! 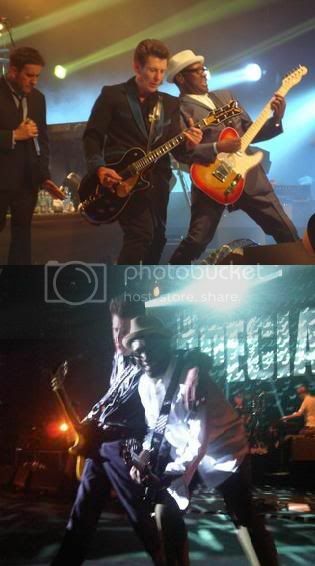 I ordered a larger signed poster from a band last month (The Spitfires), and the cost of the poster was £10 and signed by all the band, obviously a member of Madness can demand a higher price than a band still trying to make a name for itself, but the postage for The Spitfires poster was £2.90, I cannot see any justification for the inflated postage charge for this poster. I recently ducked out of buying a signed poster for The Rifles because of the same £6.90 postage charge and settled for a signed CD instead- this was also through Pledge music, and there were a few discontented fans voicing their opinions over the postage charges in general (I think delivery for a vinyl LP was about £8.00). When Cathal Smyth (AKA Chas) released his solo CD a couple of years ago, I think I picked up a signed copy for £12 including postage, I also got a large signed tour poster from Sugg's one man tour a few years back (3 or 4 years ago) for £22 including postage - so I do think Lee is asking a bit too much for this merchandise. I like to support artists I like whenever I can, but I think the price point here is beyond reasonable. Like I say, assuming the DVD goes on general release, I will make a purchase then. Your post made me laugh out loud. Think I will forego the personal appearance! Have to agree with you on the Spitfires - Madness autographs may be worth more but there is no justification on a huge price hike in postage. Should be a standard charge for each different type of item irrespective of who it is. Hasn't this been done already with 'Take It Or Leave It'? I'm not sure what this event is but just to add to the surreal flavour, that's Aswad's 'Rainbow Culture' playing in the background throughout the clip. I did end up ordering the DVD and the signed poster despite the fact I thought they were overpriced and P&P charges were a joke, mainly because I had some cash left over from what my other half gave me to buy myself some Christmas presents (you can never be disappointed if you buy them yourself). Both items were due to be posted before Christmas, last update from Lee in February stated DVDs were off to the manufacturers for production.... and nothing since. I requested a refund two weeks ago but have heard nothing. Unfortunately has to go down as another Pledge disaster. Sugg's DVD has also been delayed (was due 02.03.18, but no updates on release date). Another Pledge let down. Lee's is supposed to be out some time in May. Radio silence on the release of Suggs. At least The Beat finally has a release date - 25 May. I think Rhoda Dakar is the only artist I have pledged for who gives regular updates. Even where there are delays, Rhoda will explain what the issue is. Since my last post, someone has added a post to Lee's discussion page on the Pledge site - apparently the DVD goes on general release on 01.06.18, so pledgers should receive their items by then. It's a shame Lee hasn't updated the pledgers. Not all artists pledges turn into long delayed affairs, I have ordered items from The Rifles, The Chords, From The Jam & Shed Seven and all have been received pretty much to schedule. I am not a fan of pledge, and although Rhoda gives you updates, lm not sure what happened with her lo tec 2. She seemed to jump ship to indigogo, from where l placed my order, then l get an email telling me she has now left them and gone back to Pledge. As for Dave Wakeling and THAT Beat album. Its an absolute joke, l pledged for that over 3 years ago. I am lead to believe that he has to take some of the blame for this though. I wont be pledging again, although l cant think he will take the chance, as he has received a lot of flack over it, and lm not sure people would pledge for him again anyway. I see there is going to be a two cd sound track released to go with Lees film. Surprise surprise, its basically a Madness greatest hits again ! With a few tracks from The Nutty Boys album, and Lees ska Orchestra. There is one unreleased new solo track by Lee. Interestingly I have just been out to Jamaica and flew with Virgin (other airlines are also available) who had the Suggs movie on their in-flight entertainment. I've seen both tours of his show and have to say that the film is even better than the shows. Really funny and I'd certainly recommend a purchase when its available.